These Corporate Crystal Spectrum awards are ideal to recognize the ultimate in achievement. Boasting a 1" thick body and a unique cut pattern around this rectangular shape adds another dimension to these awards. With a choice of 3 height sizes, 6", 7", or 8" gives plenty of area for your personalization assuring that these crystal spectrum awards will be a hit. All crystal awards can be lasered or sandblasted for personalization. A handsome blue presentation box is also included with these items. Imagine the expression of the person when they see their name on one of these impressive awards. Sophistication and an elegant appeal are the highlights of this line of Corporate Diamond Glass Awards. Several cut angles on the top and sides creates the diamond shape as a wide bevel cut in the glass runs around the perimeter and frames the large personalization area which can be either sandblasted or laser engraved. Sitting atop a beveled glass base this product is available in a jade finish and in three heights 6 1/2", 7 1/2", and 8 1/2" giving you plenty of choices for your award needs. A beautifully padded and lined blue presentation box completes these fine awards that anyone would be proud to give or receive. Sophistication and an elegant appeal are the highlights of this line of Corporate Dual Column Glass Awards. Two beautiful round columns frame a large personalization area and two rectangle lids bring it all together. These can be either sandblasted or laser engraved to meet any of your personalization needs. Available in a jade finish and two heights 7" and 8 1/2" gives you plenty of choices for your recognition needs. A beautifully padded and lined blue presentation box completes these fine awards that anyone would be proud to give or receive. Elegant is the only term that one can use when describing these Corporate Acrylic Eagle Awards. A unique look of an eagle with its wings spread wide and head turned to the side are frosted to make it really stand out while body creates large engraving or laserable area that can accommodate any of your personalization needs. The matching acrylic base completes the look. Flexibility is a key component for these awards that come in your choice of clear, jade, or sapphire finishes and three sizes 6-3/4", 7 5/8" or 8 5/8". These are beautiful awards that anyone would be proud to give or receive. Sophistication and an elegant appeal are the highlights of this line of Corporate Flame Glass Awards. The glass is cut in the shape of a wide flame as a small bevel cut that runs around the perimeter adds depth to the award. Boasting a large personalization area which can be either sandblasted or laser engraved will accommodate just about any recognition wording or logo. Sitting atop a beveled glass base this product is available in a jade finish and three heights 6 3/4", 7 1/2", and 9 1/2" giving you plenty of flexibility for your award needs. A beautifully padded and lined blue presentation box completes these fine awards that anyone would be proud to give or receive. Sophistication and an elegant appeal are the highlights of this line of Corporate Keystone Glass Awards. Rectangular in shape with a unique cut to the glass around the edges provides a frame for a large personalization area which can be either sandblasted or laser engraved and will accommodate just about any of your recognition needs. Sitting atop a beveled glass base this product is available a jade finish and in three heights 6 1/2", 7 1/2", and 81/2" giving you plenty of flexibility for your award needs. A beautifully padded and lined blue presentation box completes these fine awards that anyone would be proud to give or receive. Sophistication and an elegant appeal are the highlights of this line of Corporate Monarch Glass Awards. The top has 3 distinctive cuts giving this item an almost round look at the top. A bevel cut in the glass goes around the entire award while a large personalization area can be either sandblasted or laser engraved and will accommodate just about any of your recognition needs. Sitting atop a beveled glass base this product is available a jade finish and in three heights 6 1/2", 7 1/2", and 8 1/2" giving you plenty of flexibility for your award needs. A beautifully padded and lined blue presentation box completes these fine awards that anyone would be proud to give or receive. Sophistication and an elegant appeal are the highlights of this line of Corporate Montreal Glass Awards. A large sweep arc across the top of the award gives it a classic look. A bevel cut in the glass goes around the entire award while a large personalization area can be either sandblasted or laser engraved and will accommodate just about any of your recognition needs. 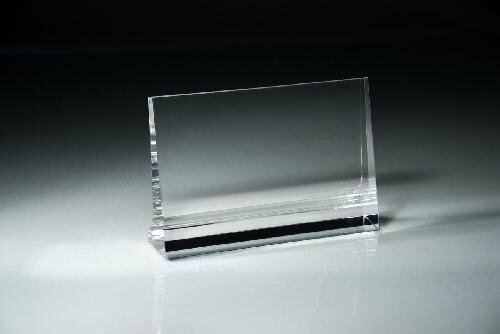 Sitting atop a beveled glass base this product is available a jade finish and in two heights 5 1/4" and 6 1/4" giving you plenty of flexibility for your award needs. A beautifully padded and lined blue presentation box completes these fine awards that anyone would be proud to give or receive. Sophistication and an elegant appeal are the highlights of this line of Corporate Pinnacle Glass Awards. The top has one end that is taller than the other giving it a unique shape. A bevel cut in the glass goes around the entire award while a large personalization area can be either sandblasted or laser engraved and will accommodate just about any of your recognition needs. Sitting atop a beveled glass base this product is available a jade finish and in three heights 7 1/4", 8 1/2", and 10 1/4" giving you plenty of flexibility for your award needs. A beautifully padded and lined blue presentation box completes these fine awards that anyone would be proud to give or receive. Phone: 480-969-2209 Toll-Free: 1-888-969-2209 Fax: 480-969-0292 Powered by BizWizard ShopKart by NetSoft Studio, LLC.